All General Plumbing Works, 1st and 2nd Fix Plumbing, Pipe Work and Cylinders. Bathroom installation,full or part refits, Wetrooms, Showers, Design. Plumbers and Heating Engineers serving the towns and villages of Wiltshire, North Dorset and Somerset. Warminster, Frome, Trowbridge, Gillingham, and all surrounding areas. I would definitely recommend Greenlife Plumbing. 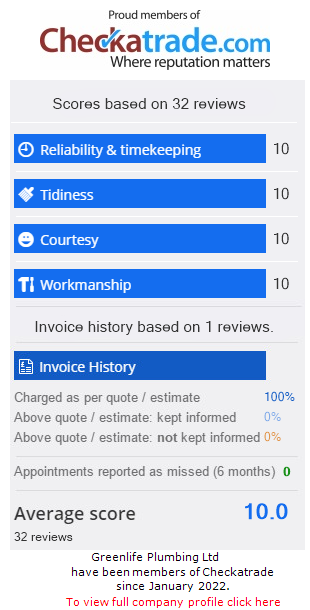 An excellent company ,polite and helpful. All work completed to a high standard. Had a problem and found Greenlife to be so helpful it was refreshing to deal with them. Cannot praise them too highly and would recommend them unreservedly. Excellent! Sam and team fitted our new boiler and the service was brilliant , very quick and efficient and a friendly team too! I needed to upgrade the boiler in my house in Bath. I had 4-5 quotes from various plumbers/companies and Green Life plumbing was the best option with a really competitive price. Sam replaced our boiler and fitted a water softener. All the work was done efficiently and we're very happy with the new setup.